Does it work with iPad Air? No, iPad Air does not fit with Perch's holder. The diameter of the pole (thinnest part) on the Perch S/M/L is 1.2 inches (30mm). What is the distance between the platform and my iPad on Perch? Below is a table of minimum height required if you are looking to place items under Perch's holder. Perch M 1' 11.25" 2' 0.25"
Perch L 3' 2.75" 3' 4"
I just got my new iPad 3, does my Perch for iPad 2 fit my new iPad 3? To install the new iPad (iPad 3) on Perch for iPad 2 holder, you will need to start the installation with the bottom of the holder first (the two razor edges). Once you have the bottom two corners filled with the new iPad you can then proceed to push the other part into the holder. You will find all the ports and controls accessible on the holder. Can I use Perch if I have Smart cover or other case installed on my iPad? No. Perch's holder will only fit iPad itself. Any case, cover, sleeve on iPad will prevent iPad from fitting into Perch's holder. However, screen protectors will not conflict with Perch. No. 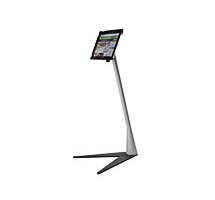 Perch Podium Stand, along with all other Perch family members, are not adjustable in height.